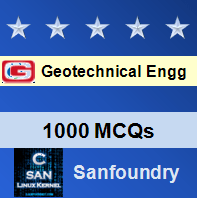 This set of Geotechnical Engineering Multiple Choice Questions & Answers (MCQs) focuses on “specific surface”. Explanation: Specific surface is usually defined as the total surface area of the soil particle in a unit mass. Explanation: The subdivision of a mass yields greater surface area than the same mass itself. The specific surface of a mass increases as the grain size decreases. Explanation: Specific surface varies for different shapes of particle having the same mass. Hence grain shape is important factor for determining specific surface. Explanation: The electrical force responsible for inter-particle effect is proportional to the specific surface. Explanation: As specific surface is associated with surface characteristics of a particle, therefore it is related with physical properties. Explanation: As the specific surface increases as the size of the grain decreases. Therefore Microscopic particles have a large specific surface. Explanation: From the expression, specific surface = surface area of particle/volume of the particle, it can be seen that specific surface is the surface area of a particle. Explanation: Permeability of soil greatly depends on the specific surface of the soil because of the viscous effects associated with surface characteristics of the grains. Explanation: The chemical activity of the clay mineral depends upon the surface area, because of the electrical charge of clay minerals is high per unit mass.